A.C. Bhaktivedanta Swami Prabhupada (1896-1977), founder of the Hare Krishna Movement, traced his lineage to the fifteenth-century Indian saint Sri Caitanya. He authored more than fifty volumes of English translation and commentaries on Sanskrit and Bengali texts, serving as a medium between these distant authorities and his modern Western readership and using his writings as blueprints for spiritual change and a revolution in consciousness. He had to speak the language of a people vastly disparate from the original recipients of his tradition's scriptures, without compromising fidelity to the tradition. Tamal Krishna Goswami claims that the social scientific, philosophical, and 'insider' forms of investigation previously applied have failed to explain the presence of a powerful interpretative device-a mahavakya or 'great utterance'-that governs and pervades Prabhupada's 'living theology' of devotion on bhakti. For Prabhupada, the wide range of 'vedic' subject matter is governed by the axiomatic truth: Krishna is the Supreme Personality of Godhead. Goswami's academic training at the University of Cambridge, his thirty years' experience as a practitioner and teacher, and his extensive interactions with Prabhupada as both personal secretary and managerial representative, afforded him a unique opportunity to understand and illuminate the theological contribution of Prabhupada. In this work, Goswami proves that the voice of the scholar-practitioner can be intimately connected with his tradition while sustaining a mature critical stance relative to his subject. 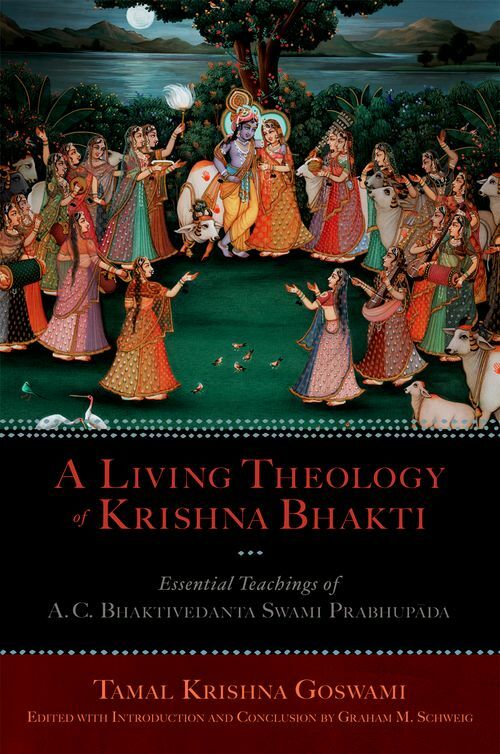 A Living Theology of Krishna Bhakti includes a critical introduction and conclusion by Graham M. Schweig. Tamal Krishna Goswami was a doctoral candidate, Divinity Faculty, Cambridge University (deceased); Graham M. Schweig is Professor of Philosophy & Religious Studies and Director of the Asian Studies Program at Christopher Newport University of Virginia.